3M™ Keyboard Drawers offer a cost effective alternative to Adjustable Keyboard Trays. Cost effective above- and below-desk solutions. 3M Keyboard Drawers offer a cost effective alternative to Adjustable Keyboard Trays, with both above- and below-desk solutions as well as height and tilt adjustable models. Each keyboard drawer features a cushiony-soft 3M Gel Wrist Rest and 3M™ Precise™ Optical Mousing Surface. The adjustable keyboard management solution where there is no space under the work surface. Great for laboratories or settings where workstations are frequently moved around. 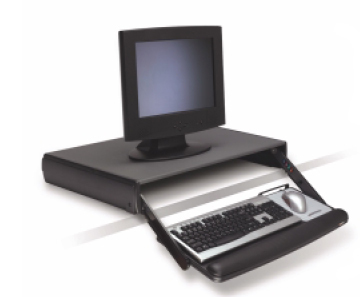 Desktop design provides height and tilt adjustment up to 3¾" below desk level. Wide platform places mouse next to keyboard for added comfort. Leatherette gel wrist rest is easy to keep clean. Easy to use and had great stability. Steel reinforced construction. No installation required. Accepts keyboards with maximum height of 1½". Lifetime warranty.